The first medical miracle Dr. Rotbart personally witnessed was as a pediatric resident. Two young brothers, ages three and seven, were brought into the emergency room and then the intensive care unit after near-drowning episodes. The recovery of one of the brothers was so unlikely, so astounding, that Dr. Rotbart was forever imprinted by the experience. This was not the last miracle he would see in his thirty-plus years as a pediatric specialist. Over the years, in discussions with his colleagues, many agreed that, despite being at the forefront of medicine and science, what physicians don’t understand often exceeds what they do understand. And even when they think they understand, they are frequently proven wrong. 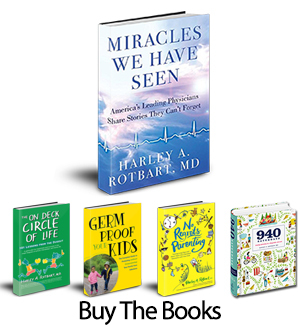 Thus began “The Miracles Project.” In 2014, Dr. Rotbart began collecting vignettes of medical miracles from esteemed colleagues throughout the country. These are not miracles resulting solely from heroic or high-tech medical interventions; those stories have a good explanation for the outcome— thoughtful, caring, and talented medical personnel applying state-of-the art technology to save lives. Rather, the stories Dr. Rotbart sought from his colleagues are of patients whose outcomes amazed their doctors and nurses, perhaps despite their heroic efforts, because of the seeming impossibility of the events that took place. Stories which recount impossible cures, breathtaking resuscitations, extraordinary awakenings, spectacular serendipities, and recovery from unimaginable disasters. Still other physicians told of experiences in which the miracle was more emotional than physical, yet also left a lasting imprint. Doctors sharing in gut-wrenching decisions made by patients and families, and then in the resulting joy—or heartbreak. Discovering a silver lining of forgiveness or resilience, a child’s wisdom or a family’s generosity of spirit, which evoked salvation and triumph in the face of sadness and tragedy. 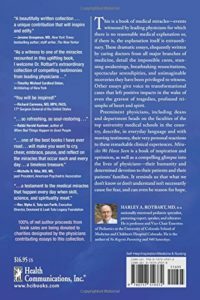 It wasn’t long before Dr. Rotbart realized these stories needed to be shared more widely with patients, families, and fellow physicians – the result is a powerful new book of 85 essays written by the physicians who themselves witnessed the remarkable events. 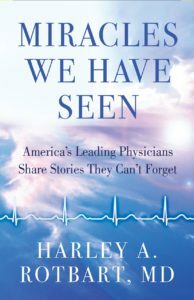 Miracles We Have Seen – America’s Leading Physicians Share Stories They Can’t Forget will be published in the Fall of 2016, and 100% of net author proceeds are being donated to 65 worthy charities designated by the essayist-physicians. The charities benefiting by sales of this book are listed at the back of the book. The word “miracle” is often used in religious contexts, and while faith and prayer certainly play an important role in many of our patients’ lives, as well as in some of the vignettes in this compilation, this is not a book about religion. It will be up to the reader to determine what, if any, role those factors play in the outcome of these stories. Rather, this is a book about optimism and inspiration, and the realization that what we don’t know or don’t understand isn‘t necessarily cause for fear, and can even be reason for hope. Click here to read the extraordinary reviews of Miracles We Have Seen.